5 Facts About Metacognition – What IS It? 1) What IS this skill? How do we use this in daily life? We may realize that there’s a problem and then need to independently find a solution. What are realistic options at the moment? How can we get what is needed to fix it? What have we learned in the past that’s worked? Metacognition is quite complex as it involves knowledge about what’s worked in the past and what might work again and/or how can we adapt for future success. It involves examining and re-examining during a task. 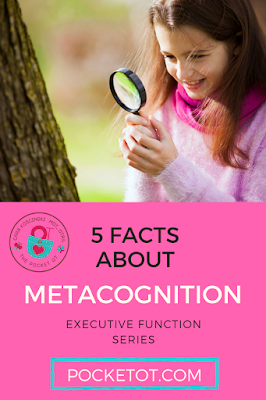 Metacognition is part of Executive Function and this continues to develop until we are in our mid-20s. According to Edutopia: Researchers at the University College London have discovered that subjects with better metacognition had more gray matter in the anterior (front) pre-frontal cortex. 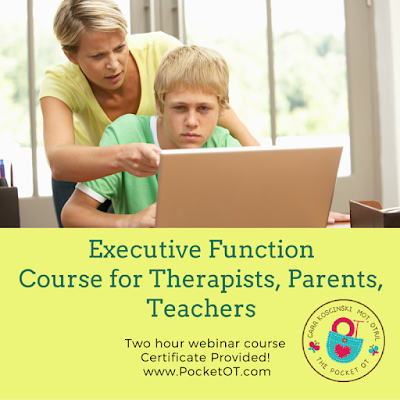 Need more information about other Executive Function topics? Read about working memory in our earlier blog post. 2) Teach Students to Self-Talk. As teachers and therapists, we can help our students to develop their inner voices. First, help them to realize they HAVE an inner voice! Begin by asking them to talk through a task. Demonstrate it for them since they may not realize their potential. When working with a student, express some of the things your inner voice tells you as you work through the task. Explain that you make a choice, and then a plan about how to work through the task. Use visual cues and match them with words. Teach parents to follow through with simple tasks in which children are already successful and independent with. This builds confidence and realization that the voice is already there! Talk through brushing teeth or playing a game, for example. I realize this takes some planning and one on one teaching. This is always best in the natural setting, so plan to monitor your child closely during a difficult task. Anticipate her movements and note when she commonly becomes frustrated. Catch her BEFORE she enters meltdown or upset state. I speak about this in ALL of my conferences — NEVER try to teach a child during a meltdown, the goal should be safety when a child is in fight, flight, or freeze mode. When a child begins to show signs of frustration, ask her to make a list or state some possible solutions and then discuss why each one would or would not work. Encourage her to do this on multiple tasks in over a variety of settings for best generalization. Check out our Executive Function Course! Explains what it is and gives strategies you can use immediately to help your student and your child today. Working memory involves remembering a few pieces of information in the short-term and for a specific task. One of my favorite childhood video clips perfectly illustrates this. View the Sesame Street clip HERE. Ask kids to remember a few pieces of information as they begin an obstacle course and instruct them to stop and repeat the information randomly. Like all skills, this takes practice and needs to be rehearsed often in order to be generalized into daily use. Brainstorming ideas help to increase creative thinking and are great because there are really no right or wrong ideas. Brainstorming encourages children to come up with creative strategies and to see then visually on paper. There are many ways to brainstorm, but my favorite way is to write ideas onto index cards and put them into piles either in order of which to try first, things that might/might not work, etc. Pair children with those who are strongly creative to help with peer interaction. Here’s a site with free printable graphic organizers. Do you have any ideas to help children with metacognition? I’d love to hear them!